Lament for Kosovo : mandolin ensemble / by Betty Beath. Lament for the victims of war : for solo piano / Betty Beath. 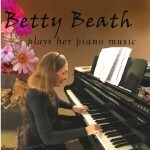 Betty Beath plays her piano music. Journeys of the mind / Betty Beath. Lament for Kosovo / Beath. Trombone concerto / Rabushka. El dia de los muertos / Fetherolf. Cheap trills / Patterson. Lament for the Victims of War (previously titled Lament for Kosovo) was written for Adrian Hooper and the Sydney Mandolins in 1999 who gave the first performance of the work in that year; later their performance of the piece was recorded and broadcast by the ABC. While writing this work I was deeply moved by the unfolding events in Kosovo and at the same time experiencing the sad fragility and decline of my mother. Previously I had written for the same ensemble Mikri Thalassa a piece which had been received with enthusiasm by musicians and audiences and I had this in mind as I set out to write the new work. However, the feelings that were uppermost in my heart and mind at that time emerged in what I saw as a 'lament for Kosovo and for the suffering of all those involved in such conflicts around the world'. Because this new mandolin piece became personally significant I went on to extend and develop the 'lament' first as a piano solo, again titled Lament for Kosovo and later, as a work for string orchestra titled Lament for Kosovo Adagio for Strings. There have now been many significant performances of all of these works, nationally and internationally. In 2008 the Lament for Kosovo, in its original form for mandolins re-emerged on concert programs. This followed Adrian Hooper's generous sharing of the unpublished score with the Director of the Providence Mandolin Orchestra, Mark Davis. He has, since that time, intorduced the work to American audiences and included it in programs performed on tour in France and in the Nederlands where the Providence Mandolin Orchestra collaborated with the Het Consort whose Director is Alex Timmerman. Previously titled Lament for Kosovo. This work was written at a time when every day our television sets gave us images of refugees from Kosovo struggling in long straggling lines across vast, snowy mountains. Since then we have witnessed the horror of more and more innocent victims of war, people of many, many races and religions who are forced to endure hardships that we can hardly imagine. It seemed that I must change the title of the work to include them all. 5 Aug 2018: at the Bourbaki Ensemble: war and peace: music for strings (St Stephen's Church, Newtown). Featuring David Angell, Bourbaki Ensemble. 6 Nov 2014: at FRIEDENS-KONZERT (Wiener Konzerthaus). Featuring Frauen-Kammerorchester von Osterreich. 10 Sep 2009: at Katie Zhukov (Nickson Room). Featuring Katie Zhukov. 12 Nov 00: Public Schools Charity Committee's annual Celebration Concert, Sydney Opera House.. Featuring Wendy Huddleston, Armidale Connection. 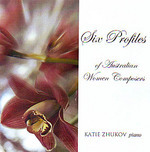 17 Sep 00: Recital program celebrating the work of Australian women composers at the Queensland Art Gallery.. Featuring Jenni Flemming. 2 Jul 00: Hunters Hill Music, Town Hall, Alexandra Street, Hunters Hill. Featuring Sydney Mandolins, Adrian Hooper.